If that stick shift just doesn’t feel right in your hand it’s time for a change. This hack puts a gaming joystick in the center console of your hoopty as a gear shifter. [Ilias] used a joystick from about 1991 to replace the stock shifter. It jogs our memory when he mentions that this thing saw a lot of use playing X-wing vs. Tie Fighter. Boy did we burn up a ton of time playing that one too! He actually broke the stock part getting it off (find a shop manual for your car if you’re afraid of this). But once the grip was removed he was relieved to find the joystick fit perfectly. The two molded plastic halves of the joystick screw together. To join them with the shifting level he used epoxy putty. The momentary push switch for that thumb button is still in there. But it doesn’t look like he hooked it up to anything. If we were to give this one a try we’d have to find some use for it. Got any suggestions? Let us know in the comments. [Rich] is embarking on a fairly long bike trip in a few weeks – Seattle to Portland – and thought including some 3D printed gear on his ride would be a fun endeavor. His first idea was a printed belt drive, but the more he looked at that idea the less realistic it seemed. 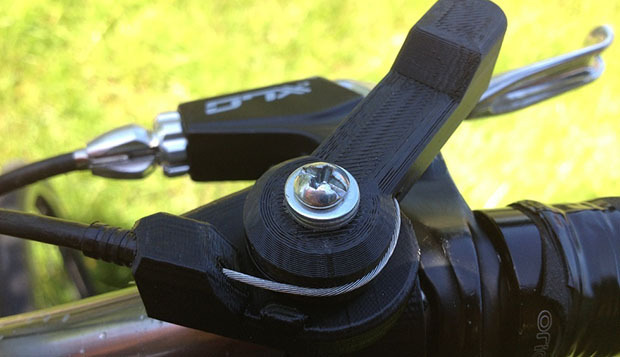 He finally hit upon the idea of creating a 3D printed bike shifter, and after an afternoon of engineering and printing, the shifter ended up working very well. [Rich]’s shifter is actually a friction shifter. Instead of ‘clicking’ into position, this type moves the derailleur gradually. It’s much more tolerant of slight misalignment, and most touring bikes – the type that would embark on long journeys along the coast of the Pacific northwest – have these types of shifters. Total printing time was about one and a half hours, and was attached to [Rich]’s bike with off-the-shelf hardware. He’s already put about 150 miles on his custom designed shifter with no signs of failure.